I have just discovered pancetta! I thought what I had been getting at Trader Joe’s might have been close to the real thing, but I was sorely mistaken. I went to a local Italian Deli and Butcher near my work and I bought some pancetta and some Italian flour, in an effort to get to know more about my roots through food. I sometimes relate more to the Puerto Rican side. It get’s even weirder because I cook mostly Asian food! Normal is no fun. A few days later, I was at one of my fave grocer’s at the farmers Market, and that day they had a box of Vietnamese Spinach. It tastes like most spinach, but is less leafy. What is lacks in leafiness it more than makes up for in length and leaf size. I bought it thinking I would be able to pair it with pancetta. 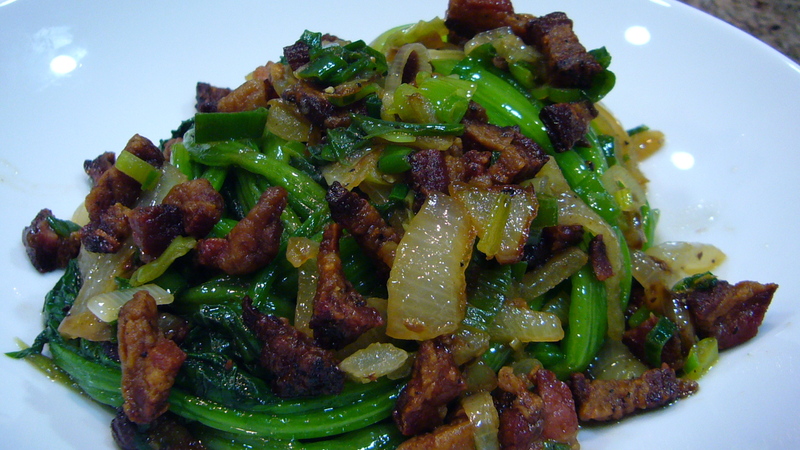 I fried the spinach up with some pancetta, onions and garlic after blanching the it to keep the green and preserve the taste. I added a half teaspoon of apple cider vinager, salt and pepper for seasoning. 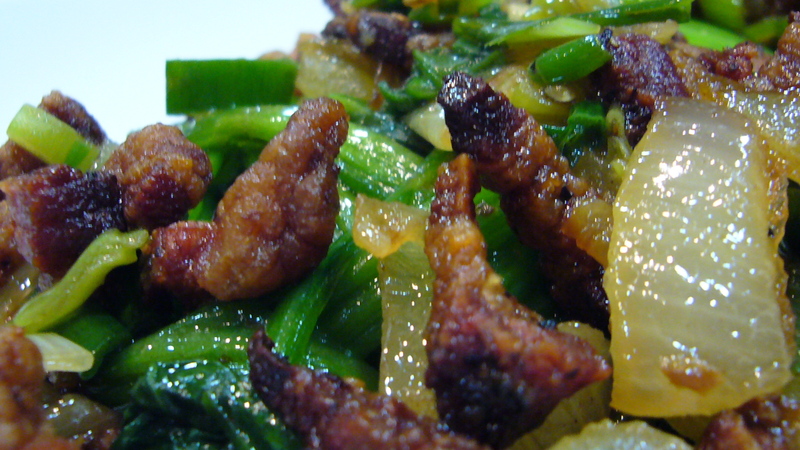 I would suggest cutting Vietnamese spinach with some food shears after presentation is done. The length of each leaf make it hard to eat otherwise. ← Choco chip cookie love!